Aims: This study aimed to evaluate the safety and effectiveness of double contact lens-assisted corneal cross-linking (CXL) in keratoconus patients with very thin corneas. Settings and Design: This is a prospective, interventional, nonrandomized, and noncontrolled case series. Subjects and Methods: Twenty eyes of 15 patients with the corneal thinnest point (CTP) <400 μm were included in the study. Uncorrected distance visual acuity (UDVA), corrected distance visual acuity (CDVA), Scheimpflug imaging, and endothelial cell loss were evaluated at baseline and at each study visit. After corneal epithelial debridement, ultrasonic pachymetry was used to measure CTP. Double soft contact lenses were applied while riboflavin was instilled every 2 min and ultrasonic pachymetry was repeated. The cornea was then exposed to ultraviolet A light (370 nm, 3 mW/cm2) for 30 min. Riboflavin 0.1% was administered every 2 min during irradiation. Statistical Analysis Used: Statistical evaluation of values at baseline and 6- and 12-month after CXL was performed using t-test with SPSS software version 20 (SPSS Inc., Chicago, IL, USA). Results: Following epithelial removal, mean CTP was 271.4 ± 13.7 μm (range: 263–284 μm). After double contact lens placement, mean CTP increased by 196.8 ± 15.4 μm (range: 188–223 μm) for a mean thickness of 467.1 ± 19.4 μm (range: 423–508 μm). No statistically significant differences were observed in maximum keratometry value (Kmax) and posterior elevation 1 year after CXL. Endothelial cell count, CDVA, anterior elevation, and average of simulated keratometry values (Average SimK) as well as the CTP were not significantly different before and 12 months after CXL. No postoperative complications were encountered in any of our patients. Conclusion: Double contact lens-assisted CXL can be effective for stabilizing corneal topography in eyes with advanced keratoconus, including those with corneas that are too thin for traditional CXL. Further controlled studies with a larger sample size are recommended to confirm our findings. Keratoconus is a corneal disorder that occurs when the cornea becomes progressively thinner. As a result of this thinning, the cornea gradually loses its structural integrity and begins to bulge forward. As the cornea becomes thinner and more steep, vision can become more difficult to correct with glasses and contact lenses. In more severe cases of keratoconus, corneal scarring can also occur. Unfortunately, most patients are in their 20s or 30s when diagnosed with keratoconus and this condition can significantly impact their lives. Current treatments for keratoconus aim to flatten and/or stabilize the cornea. These include spectacle use, rigid gas-permeable contact lens wear, laser vision correction, collagen cross-linking (CXL), and, in severe cases, corneal transplant. With the exception of transplant, CXL is the only therapy that can slow or prevent disease progression.,, However, the procedure is performed usually on corneas that have a thickness >400 μm following epithelial removal. Unfortunately, CXL cannot be performed when the cornea is thinner than 400 μm following epithelial debridement. Therefore, the use of contact lenses was proposed as a method to augment stromal thickness before performing CXL in eyes with a stromal thickness between 350 and 400 μm. Here, we further examine the efficacy of a modified double contact lens-assisted CXL procedure. The protocol was reviewed and approved by a private hospital's institutional review board as a prospective, interventional, nonrandomized, and noncontrolled case series. Written informed consent was obtained from all patients following a conversation about the nature and risks/benefits of the study participation. All study conduct adhered to the tenets of the Declaration of Helsinki. Patients were recruited in this study if they had evidence of progression of keratoconus. The anterior and posterior elevation maps and keratometry (Kmax) maps, as well as the corneal thickness maps at the thinnest point (obtained using the Pentacam tomography), were evaluated. Endothelial cell density (ECD) (cells/mm2) was documented preoperatively and postoperatively at 12 months. Exclusion criteria were a history of herpes simplex keratitis, significant corneal haze, dry eyes, and autoimmune disease. Topical anesthesia (0.4% benoxinate HCl, Benox®, EIPICO, Egypt) was administered to control ocular pain. The epithelium was then removed over a central circular area that was 8.00 mm in diameter, and ultrasonic pachymetry (Corneo-Gage Plus, SonoGage, Inc., Cleveland, OH, USA) was performed to measure corneal thinnest point (CTP). The first soft contact lens, non-UV-blocking SofLens weekly disposable soft contact lens (Bausch + Lomb, Bridgewater, USA), was applied and riboflavin was instilled every 2 min for 30 min. If the CTP was <400 μm, a second soft contact lens was then placed on the cornea and ultrasound pachymetry was repeated. Hypo-osmolar riboflavin was applied every 2 min. The cornea was then irradiated with UVA light (wavelength = 370 nm, irradiance = 3 mW/cm2) for 30 min. During UVA irradiation, hypo-osmolar 0.1% riboflavin was administered every 2 min. All patients used topical ofloxacin 0.3% (Allergan Labs, Irvine, CA, USA) and 0.1% fluorometholone (Allergan, Inc. Irvine, CA, USA) following the procedure until the epithelium had healed. Fluorometholone was then tapered over 5-week period. Corrected distance visual acuity (CDVA) and corneal tomography (OCULUS-Pentacam®, Wetzlar, Germany) were measured in each patient before and at the 6- and 12-month follow-up visit after CXL. Corneal ECD (EM-3000 specular microscope, Tomey, Nagoya, Japan) was also evaluated at each study visit. Statistical evaluation of values at baseline and at 6- and 12 months after CXL was performed using t-test with SPSS software version 20 (SPSS Inc., Chicago, IL, USA). P <0.05 was considered statistically significant and 95% confidence interval (CI) was used for computation purposes. A total of 20 eyes of 15 patients (9 males and 6 females) were recruited in this study. Average patient age and disease duration were 25.13 ± 4.1 years and 36.1 ± 13.2 months, respectively. Patients were followed up for 13.15 ± 4.85 months (range: 6–18 months). Following epithelial removal, all eyes had a CTP <300 μm and required the use of two contact lenses. Mean CTP was 271.4 ± 13.7 μm (range: 263–284 μm) after corneal epithelial removal. After contact lens placement, mean CTP increased by 196.8 ± 15.4 μm (range: 188–223 μm) for a mean thickness of 467.1 ± 19.4 μm (range: 423–508 μm). Uncorrected distance visual acuity was almost same at preoperative (0.05 ± 4.73), 6 months, and at the last postoperative follow-up (0.05 ± 4.59) [Figure 1]. Corneal tomography was stable and CDVA had not significantly changed from preoperative vision (pre-CXL decimal CDVA: 0.4 ± 2.21 and post-CXL decimal CDVA: 0.4 ± 2.19, P > 0.05). No eyes lost any line of CDVA [Figure 2]. The corneal astigmatism values at 1-year examination were not statistically significantly different from the preoperative measurements (from 6.31 ± 5.29 to 6.13 ± 5.16 D) (P > 0.05). The Kmax value decreased by a mean of 1.1 D from preoperative to 1-year evaluation (from 68.35 ± 5.59 to 67.25 ± 5.67 D) [Figure 3] (95% CI: −4.7–2.5, degree of freedom [df]: 38, P = 0.5404). The Kaverage decreased by a mean of 0.5 D from preoperative to 1-year evaluation (from 51.82 ± 3.49 to 51.32 ± 3.43 D) (95% CI: −2.7–1.7, df: 38, P = 0.6503) [Table 1]. Anterior elevation at the thinnest location was measured preoperatively and at 1-year postoperatively by Pentacam. There was no significant reduction in anterior elevation at the thinnest location at 12 months posttreatment, from 41.58 ± 5.10 D preoperatively to 41.33 ± 5.17 D at 12 months posttreatment (95% CI: −9.6–9.1, df: 38, P = 0.9572). At the thinnest location, the mean posterior elevation increased; however, it was not statistically significant, from 99.15 ± 19.02 D preoperatively to 101.13 ± 18.35 D at 12 months postoperatively (95% CI: −9.98–13.94, df: 38, P = 0.7394). 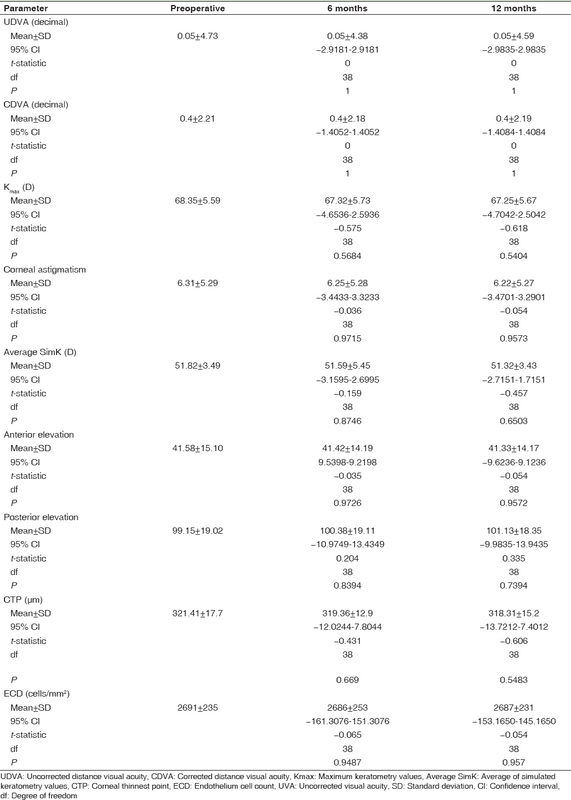 Endothelial loss was not observed in any patient (pre-CXL ECD: 2691 ± 235 cells/mm2, post-CXL ECD: 2687 ± 231 cells/mm2, P = 0.957) (95% CI: −153.1650–145.1650, df: 38, P = 0.957). Keratoconus treatments aim to halt the progression of keratoconus and to stabilize or regularize corneal shape. CXL has been shown to successfully achieve these goals and is the only therapy that can slow or prevent disease progression. 1-3 However, the procedure can only be performed on corneas that have a thickness >400 μm following epithelial removal. The current study showed that CXL can successfully stabilize corneal topography over the long term (12 months) in eyes with keratoconus and thin corneas (<400 μm after epithelial removal) when a soft contact lens and hypo-osmolar riboflavin were used to increase corneal thickness before cross-linking. Furthermore, significant endothelial cell loss was not observed and visual acuity remained sustainable during the follow-up period. Treatment efficacy of double contact lens-assisted CXL performed on eyes with thinner corneas (<400 μm following epithelial removal) was similar to that observed with traditional CXL performed on eyes with thicker corneas. A meta-analysis on published studies showed that traditional CXL stabilized corneal topography for at least 18 months. Furthermore, corneal ECD was not compromised following either traditional CXL,,, or contact-lens assisted CXL. Some of our results also differed from those previously obtained by others. Traditional CXL resulted in a Kmax value decrease of 1–2 D. Here, our patients had a reduction in the Kmax value of 1.1 D. Furthermore, CDVA did not significantly change from baseline in our patients following contact lens-assisted CXL. In contrast, visual acuity improvements were observed following traditional CXL and these gains persisted over an 18 to 24-month observational period.,,, Given that all of our patients had thinner corneas, it is not surprising that corneal curvature changed less than in patients with thicker corneas and that CDVA changes were lower than those in eyes with thicker corneas. A smaller amount of corneal tissue to cross-link would result in less tissue shrinkage than in eyes with a larger amount of corneal tissue. Our study has some limitations: the sample size was relatively small and further study is needed on a larger number of patients to better understand the clinical outcomes following contact lens-assisted CXL. In addition, patients were only followed up in our study for 12 months following CXL, and studies with extended follow-up periods are needed to better understand long-term clinical outcomes. Double contact-lens assisted CXL may be a viable treatment option for patients with keratoconus and corneas that are too thin for traditional CXL. Ashwin PT, McDonnell PJ. Collagen cross-linkage: A comprehensive review and directions for future research. Br J Ophthalmol 2010;94:965-70. Coskunseven E, Jankov MR 2nd, Hafezi F. Contralateral eye study of corneal collagen cross-linking with riboflavin and UVA irradiation in patients with keratoconus. J Refract Surg 2009;25:371-6. Brooks NO, Greenstein S, Fry K, Hersh PS. Patient subjective visual function after corneal collagen crosslinking for keratoconus and corneal ectasia. J Cataract Refract Surg 2012;38:615-9. Kocak I, Aydin A, Kaya F, Koc H. Comparison of transepithelial corneal collagen crosslinking with epithelium-off crosslinking in progressive keratoconus. J Fr Ophtalmol 2014;37:371-6. Rush SW, Rush RB. Epithelium-off versus transepithelial corneal collagen crosslinking for progressive corneal ectasia: A randomised and controlled trial. Br J Ophthalmol 2017;101:503-8. Mastropasqua L. Collagen cross-linking: When and how? A review of the state of the art of the technique and new perspectives. Eye Vis (Lond) 2015;2:19. Jacob S, Kumar DA, Agarwal A, Basu S, Sinha P, Agarwal A, et al. Contact lens-assisted collagen cross-linking (CACXL): A new technique for cross-linking thin corneas. J Refract Surg 2014;30:366-72. Chunyu T, Xiujun P, Zhengjun F, Xia Z, Feihu Z. Corneal collagen cross-linking in keratoconus: A systematic review and meta-analysis. Sci Rep 2014;4:5652. Goldich Y, Marcovich AL, Barkana Y, Mandel Y, Hirsh A, Morad Y, et al. Clinical and corneal biomechanical changes after collagen cross-linking with riboflavin and UV irradiation in patients with progressive keratoconus: Results after 2 years of follow-up. Cornea 2012;31:609-14. Vinciguerra P, Albè E, Trazza S, Rosetta P, Vinciguerra R, Seiler T, et al. Refractive, topographic, tomographic, and aberrometric analysis of keratoconic eyes undergoing corneal cross-linking. Ophthalmology 2009;116:369-78. Arora R, Jain P, Goyal JL, Gupta D. Comparative analysis of refractive and topographic changes in early and advanced keratoconic eyes undergoing corneal collagen crosslinking. Cornea 2013;32:1359-64. Hashemi H, Seyedian MA, Miraftab M, Fotouhi A, Asgari S. Corneal collagen cross-linking with riboflavin and ultraviolet a irradiation for keratoconus: Long-term results. Ophthalmology 2013;120:1515-20. De Bernardo M, Capasso L, Lanza M, Tortori A, Iaccarino S, Cennamo M, et al. Long-term results of corneal collagen crosslinking for progressive keratoconus. J Optom 2015;8:180-6.